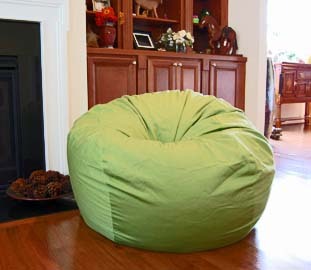 Great Ideas to Add Green to Your Home - Use Bean Bags, etc. Being eco-conscious and earth-friendly has been a continuing trend in all aspects of life, including interior design. Being "green" has been "in" for a while now. And for 2013, the fresh color green is now trending as well. Green, of course, has many tones and shades to choose from. Whether you're going for a vibrant, bright, fresh look, or trying for a more subtle feel, green has a shade for you. Let's take a bold look first at using green on your home's exterior! In this home, you find a very vibrant crayon green. I think to pull something this bold off, you can't have a home that is too large. This particular townhouse is perfect to show off this bold look. Here, we have a beautiful beach house. The sea foam green has a hint of blue and is quite pretty. A favorite look of mine is a more subtle use of green, like in this sage-colored house. Perhaps you don't want your entire exterior painted green? This home shows off a beautiful dark green roof that complements its warm cedar wood boards. I love this home. Or, you can just paint your front door green and have this happy color welcome your guests. Now let's go inside and add this awesome color to our interiors. One of the easiest ways to add a new color into a room is by incorporating bean bag chairs into your decor. This lime green organic bean bag chair from Ahh! Products is perfect to do this because you can take it to any room that needs a splash of green. Plus, it's great for extra seating in a pinch! 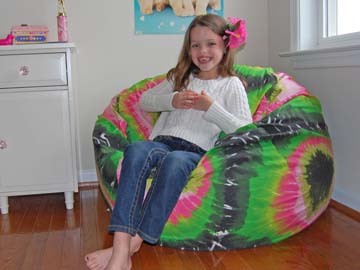 For kids' rooms, you can use a brighter one, like this tie dye bean bag. Green is mixed up with other vibrant colors to create a fun accent piece. For Mom and Dad's bedroom, changing out bedding is a quick and easy way to use green. You can do the entire bedding set, or just a few accent pillows or shams. Wall are also a great place to use a new color. You can try this fresh paint that goes perfectly with the white drapery and white wainscoting panels. This is such a clean, crisp look. Or, go bold and really do it up green! The monochrome black and white zebra mirror and patterned carpet show off the bright walls. Wall paper is another wall treatment that can add a splash of color and texture to your walls. This stripe goes well with the palm plants, giving this room an island feel. This extravagent wall paper is beautiful and lends a nice texture as well as color to the wall. In the kitchen, you can paint one cabinet to create a focal point. Or, paint them all, but you may want to go with a more subtle shade like in this gorgeous kitchen. You probably don't want to be blasted by cabiinets that are super bright. Drapery, whether from floor to ceiling like in this home, or just a valence is a nice splash of color. This is a hard one to pull off, but green uphostered furntiure can be beautiful. You can also just stick to one accent chair, or with a fabric that has just a hint of green. A coordinating rug will tie in green walls and accents. It's especially pretty on hardwood floors. And last, but not least, a simple vase or throw pillows added to your decor can do wonders to rejuvenate your interiors. I just love green. How do you feel about this trend and do you use green in your home? Please share!